Sea of Cortez. Located in the downtown area of Los Barriles. 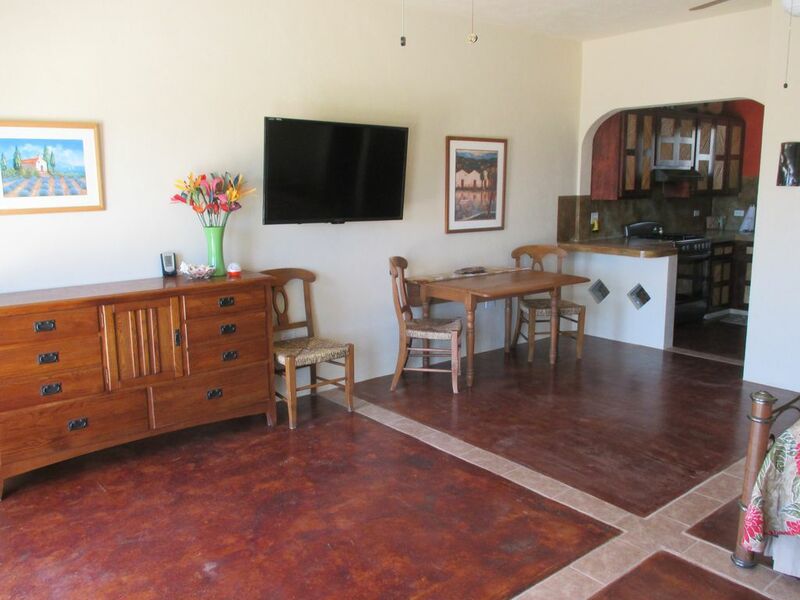 Full size kitchen and appliances, sitting area, and outside patios for your comfort. Awesome views of the Sea of Cortez, as well as the beautiful mountains from the roof terrace. Includes king size bed, utilities, wifi, Dish satellite with a 50" tv. No need for bottled water here, on sight water filtration at no additional cost! Airport transportation is available upon request for a fee. Guests need to know that there are two small dogs on the property. We allow pets with a $25.00 pet fee per pet, we also offer a daily pet sitting service if you are going to be away for a extended time for only $10.00 per day. Los Barriles has everything; grocery stores, small shops, friendly people, art classes, exercise groups, fishing, restaurants, quad rentals, car rentals. The food is incredible. What Los Barriles does not have are vendors, crowds of people and traffic. It is a community. Smoking allowed outside in the garden area. Air conditioner available for $5 extra a day if you use the air conditioner. We offer airport transportation and we also have quads available for rent on sight please ask for details. Well appointed place that had everything we needed. Doug and Teri are great hosts that made sure everything was just right for us. They are also very knowledgeable about the area and all the things you can do around there. Looking forward to staying there next year! The studio is sparkling clean and has all the comforts of home. It's even better than the pictures! It's within walking distance to downtown. The owners are friendly, hospitable and knowledgeable, about great things to do in the area. The roof top terrace is a nice place to hang out for sun during the day and peaceful in the evenings. They also have quads to rent on the property and very helpful, checking to assure your stay is going well. A + they are friendly people and they keep their property up. We stayed here for 6 days and couldn't have been happier. The place is spacious with a large bed, a sofa, and a full kitchen and bath. It was perfect for the 2 of us. It sits about a block from all the restaurants and a small grocery store so you are right near everything you need, but it's nice and quiet nestled in the little neighborhood. Doug and Teresa are wonderful, super friendly hosts. We took advantage of their airport service which is great. We will def be staying with them again. Loved the pups too. Thanks for the hospitality! This was my first time in los barriles baja. I had a great time staying at casa dulce vida rental. Doug & terri foster are friendly people. Los barriles is a pretty awesome small quiet, relaxed fishing and kite surfing town. Casa dulce vida was a really quiet rental safe & secure. doug and terri are pet lover's they have 2 small friendly dog's and a cool little parrot. The studio is very spacious with air conditioning to keep cool and a comfortable bed to sleep well. Also It has a full kitchen. The location is really good walking distance to town and the beach. They even have quads to rent. You'll get a better deal if you rent from them. Unless you rent a car. I definitely will stay at casa dulce vida again. Very close to one of two Pickle Ball courts in town.